Consider this: A physician orders a diagnostic imaging exam that you, as the radiologist, know is not appropriate because it won’t answer the diagnostic question or provide any insight to the patient’s condition. Do you do the exam because you have an order and can bill for it, or do you say no and discuss it with the physician who ordered it? Some leaders in radiology, including RSNA past-president Gary J. Becker, MD, believe that if radiologists don’t speak up and perform only appropriate imaging studies, they may eventually find themselves irrelevant. Another reason radiology is targeted is the sixfold increase in medical radiation to the population over the last 25 years, the bulk of which is attributable to CT and nuclear medicine studies, says Becker, a professor in vascular and interventional radiology at the University of Arizona College of Medicine. Included in this increase in radiation exposure “is a wealth of evidence to show a significant component of overuse,” he says. He notes that several imaging studies are on the list of medical procedures targeted by the National Priorities Partnership (NPP) because of overuse. The NPP was convened by the National Quality Forum (NQF) to address current healthcare challenges. The mission of the NQF, formed in 1999, is to improve the quality of American healthcare by setting national priorities and goals for performance improvement, endorsing national consensus standards for measuring and publicly reporting on performance, and promoting the attainment of national goals through education and outreach programs. “Overuse comes in many forms, ranging from self-referral by nonradiologists to inappropriate utilization to duplicate studies due to poor communication in our fragmented healthcare systems and studies done simply because of perceived medicolegal risk,” Becker says. Fellow RSNA panelist Stephen J. Swensen, MD, MMM, FACR, of the Mayo Clinic in Rochester, Minn., also said in a recent interview that radiologists have traditionally performed diagnostic imaging exams ordered by other physicians without questioning their appropriateness. Under their code of ethics, he says, surgeons would never perform surgery on a patient without examining the patient and determining for themselves whether the recommended surgery was appropriate. Not so for radiologists, Swensen says. “If it’s ordered by another physician, we will do our best to get that exam done,” he says. “We don’t question whether an ultrasound or an MRI or a CT or perhaps no exam at all might be better. … We do what we’re asked.” It’s not surprising, Swensen says, that most estimates show about 30% of exams do not meet standard appropriateness criteria. Another problem is the threat of malpractice lawsuits. “Some of it is driven by patient expectation or fear of liability for misdiagnosis,” he says. Becker says CPOE systems that are already in place are proving their worth. The system in use at Massachusetts General Hospital (MGH) in Boston provides the ordering/requesting physician with up-to-date information at the point of care on the appropriateness of the requested procedure. The information is based on the ACR’s appropriateness criteria as it applies to the specific patient, he says. “This interactive component provides the physician an opportunity to change or maintain the original order based upon the information—decision support—that has been provided. In the aggregate, the [CPOE] at MGH has managed to decrease volume of and expenditure on high-tech imaging procedures.” What’s even more powerful, Becker says, “is that the back-end database that provides individual practitioner-level data has documented improvement in ordering behavior due to the CPOE system.” Similar results have been obtained through the work of the Institute for Clinical Systems Improvements in Bloomington, Minn., Becker notes. Swensen says when imaging tests are based on appropriateness criteria, it helps control healthcare costs because overutilization leads to unnecessary procedures that not only cause the patient and his or her family unnecessary anxiety but also costly follow-up care. Not long ago, his good friend had a chest x-ray as part of an executive physical exam. “There was no medical reason for that chest radiograph. He had no pulmonary symptoms. He had no smoking history,” he says. Nonetheless, a chest x-ray was performed and it showed multiple bilateral lung nodules. “The findings led to a more than $50,000 workup, including a CT-guided biopsy and eventually thoracic surgery, all of which were to make a diagnosis of benign disease,” he says. “As radiologists, it’s our responsibility to do the right exam and no one else’s,” Swensen says. 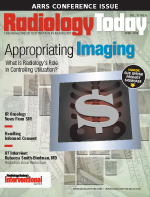 Radiology and imaging informatics are dedicated to advancing all aspects of imaging services within the healthcare enterprise, including safety, accuracy, efficiency, patient centeredness, timeliness, and usability, Becker says. — Beth W. Orenstein is a freelance medical writer based in Northampton, Pa. She is a frequent contributor to Radiology Today.